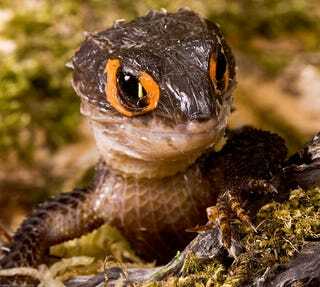 This is the Orange Eyed Crocodile Skink, Tribolonotus gracilis. Found in Northern Papua New Guinea and it's off shore islands, this little skink rarely exceeds 10 inches. They are fairly secretive and prefer lush vegetation to hide in. There are several other related Tribolonotus species including the Red Eyed, Painted and a solid black/brown version but the jury is still out as to which of these are separate species, subspecies or simply variants. They are fast runners, good climbers and very efficient swimmers who are know to soak in water. Females have two ovaries but only the right oviduct and produce only a single egg at a time.The egg is large and the young are comparatively large at hatching. In spite of the small number of offspring the skink is plentiful across much of it's range suggesting that it's quality over quantity reproductive approach has been successful. Females practice maternal care by curling around their egg or laying close to the nest. While there are other lizards which vocalize, the Crocodile Skink has the distinction of being the only species known to vocalize in defense of offspring. They will also repair the nest if it has been disturbed. Both males and females vocalize and their voices have been described as surprisingly loud. Offspring stay close to mom for several weeks and the lizards seem to be fairly gregarious with females and juveniles forming loose grouping and males defending territories. Juveniles will play dead if captured. In captivity, they are sometimes such good actors that they have been put in the trash before handlers realize their mistake. The red or orange eye decorations are thought to play a role in species recognition but may also help deter predators by fooling them to think the skink is either larger than it appears or is a different, larger animal.